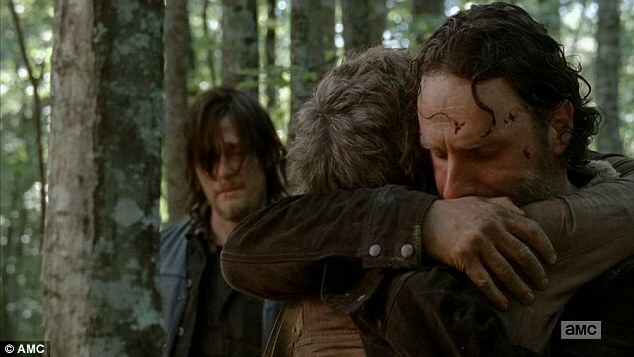 One of many emotional scenes on The Walking Dead this season. Recently, I read an article at CNN.com about “The Walking Dead,” in which Forbes was quotes as saying “‘The Walking Dead’ has officially made the zombie genre emotional.” This comment, while seemingly innocuous, got me thinking. For a long time, I have enjoyed shows, books, and movies that are judged (unfairly) as weird, wrong, or somehow lesser because they are a part of a genre that mainstream folks do not understand. From “Buffy the Vampire Slayer” to “The Walking Dead,” people always find it strange that I find such value and meaning in shows with such absurd premises and silly titles. The Walking Dead is, on the surface, a “zombie genre” show, sure. But it has always been emotional because, at its core, it is a show about people in community trying to survive unimaginable circumstances. Thus, it is and will always be inherently emotional because it is written with so much truth, heart, and soul. Sunday’s episode didn’t make it “official,” it has always been so. I am not sure who first coined the phrase, “Don’t judge a book by its cover,” but it’s been around for so long that you’d think people would follow that advice. Yet, for all our quoting of this cliché, which is only cliché because it is good and true advice, we seldom follow it. From art (TV shows, movies, books) to people and communities, humankind is constantly making judgments based solely on looks. Maybe it’s just human nature. Maybe it is just an innocent response since “looks” are the first thing evident to us in the physical world. This tendency is so prevalent and, in the case of how it affects our interpersonal and community relationships, it is heartbreaking and even dangerous. I don’t know what happened the day Michael Brown was killed, but I do know that his appearance had at least something to do with his death. Had he been an unarmed white woman, for example, Officer Wilson would have probably found another way to handle the situation that didn’t involve firing 12 rounds at an unarmed teenager. Police officers have to size up situations quickly and make literal life-or-death decisions, so it makes sense that Wilson would have to take all factors into consideration. Still, I cannot help but think that Michael Brown would be alive today if his skin color were lighter, his clothes a different style, or if the confrontation had taken place in a different town with fewer racial tensions. Race isn’t the only arena where judging a book by its cover becomes problematic. Special needs people also face this conundrum. My son’s appearance as “normal” and his happy demeanor lead people to assume he is a typical child. They’ll say, “But he looks so normal,” or “I would never have known he had autism if you hadn’t told me.” This is not usually a bad thing except when Weston’s autism causes some sort of public meltdown. Then people assume Weston is just acting out, judging and condemning our parenting and his behavior rather than showing empathy and understanding. If he had a visible, physical disability, perceptions would be different, but our lives would be no easier. I can remember using my disabled parking permit when I was a teenager and being stopped by a mall cop telling me, “You cannot use that unless the handicapped person is in the vehicle.” I was disgusted with his assumption and hurt that I had to explain myself. It isn’t just the visibly disabled who need some help in this world. All of these issues (and a great many others) are a problem in the tangible, physical world as interpersonal relationships can be complicated or prevented outright based on “covers.” Yet this isn’t a problem in the virtual world. People often lament the effect technology is having on our interpersonal relationships, remarking on how social media is destroying the very fabric of society by somehow breaking down our interactions and making them less personal. In some cases, that may be true, but I would argue that interaction via social media eliminates much of our tendency to “judge a book by its cover” thereby basing our relationships on something more than physical appearance. True, there are many “evils” in the internet world and when we hide behind our online presence or use virtual anonymity to hurt others, there are devastating results. I have, however, developed many great friendships based on common interests that are every bit as real to me as the friends I have stumbled upon as I go about my daily life. I have built lifelong friendships with people who for many reasons–including appearance-based judgements–I would never have met. Relationships not built on physical proximity are not automatically less real or more superficial. On the contrary. They can be much more genuine because they force us to look beyond the “cover” to the heart, mind, and soul of the person with whom we are engaging. All of this to say: STOP THE INSANITY! But seriously. Whether we’re talking about people, relationships, books, TV shows–whatever–can we please stop diminishing or dismissing our respective “books” based solely on their “covers?” Can human beings finally acknowledge that the world–including the people in it–is more than its surface?